Time is money. Idling around while you wait for your sluggish compressor to fill your air shocks is like shoveling greenbacks into a furnace. For lightning-fast shock adjustments, equip your rig with the Load Controller I. More hare than tortoise, this on board air control system uses a powerful 12-volt compressor that makes quick work of inflating or deflating your air bags. Just how speedy is your Load Controller I? It moves air twice as fast as the Load Controller II, so the job takes half the time! Plus, your Load Controller I gives you the power to fine-tune your air shocks right from your rig’s helm. 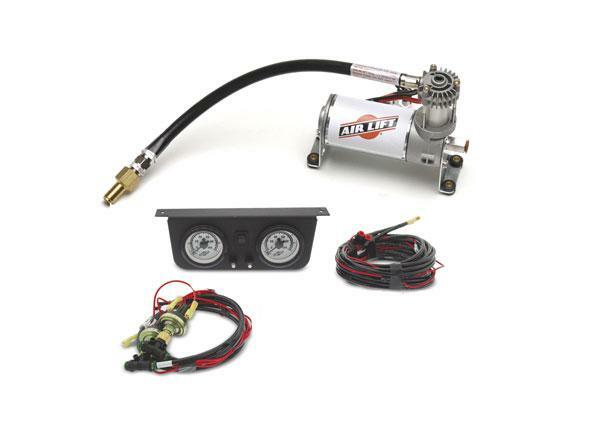 Air Lift’s Load Controller I comes in either a single or dual unit. The single system adjusts front-to-back for even leveling and solid roll stability. With the versatile dual system, you can pick between either front-to-back or side-to-side adjustments. Comes complete with all mounting hardware, gauges and a 2-year warranty.